The success of our hand pumps in remote and inaccessible parts of Africa is mainly attributed to the Vlom characteristics of these pumps. 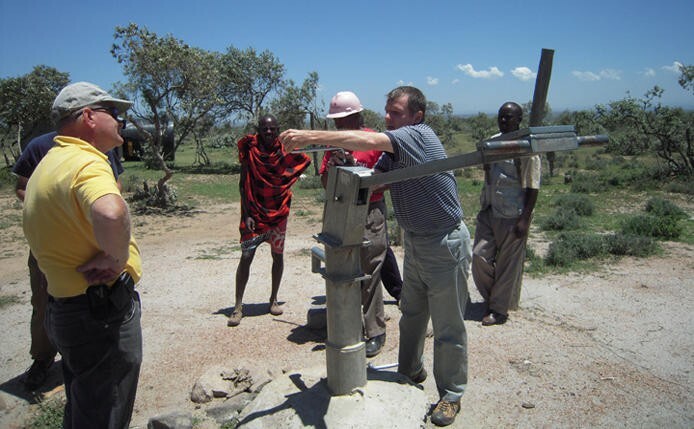 Aakash International manufactured afridev hand pumps are easy to operate and do not require a highly-skilled maintenance team to carry out routine repairs and maintenance. Aakash International produced hand pumps are also easy to install as heavy equipment and specialized tools are not required. The rising main of the Afridev hand pump is a belled uPVC column that is easily installed using two or three people. No tripod is required and, with the help of the guiding rope, the columns are installed without much fuss. The connecting hook and eye rods fit into each other and no spanner is required. Once the uPVC columns have been installed, it is no longer necessary to remove the columns when doing future maintenance. The cylinder has an open top through which the plunger rod is easily removed, allowing the hand pump technician to change the necessary seals. Aakash International hand pumps have extensive countrywide and international distribution network, which ensures that spares are readily available, thus ensuring the continued sustainability of the product.